As you know, Steve Ballmer, the "infamous" CEO of Microsoft has announced that he'd be retiring within a year. 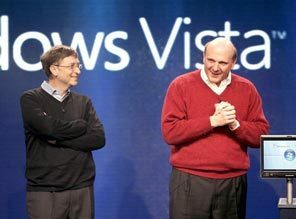 In an interview with ZDNet, Ballmer reveals that his proudest achievement over the 33 years he spent at Microsoft was being "a significant part even of the birth of intelligent personal computing." Detailing his regrets, he lays the blame solely on Windows Vista. Longhorn started out great, but later suffered from feature creep. Then the disaster that was XP (pre SP2) happened, which finally set the project straight. In the end, they came out with a better product. Say what you will, but Windows Vista was a success in its own way. It finally gave Windows the security it desperately needed, along with much needed stability improvements over XP. Windows wouldn't have survived much longer off the XP codebase regardless. I agree with the above comment. Vista was not bad, It was secure, super stable, and faster on modern hardware. Vista was unstable in many parts. It's not the worst OS from Microsoft. In all, Vista did push the envelope, but failed to live up to all the hype. Especially, when Longhorn had soooo much potential and had Windows fans craving for it's features. This is the reason I like Apple and how they do keep quiet about somethings. They don't have to drooling over a lot of features that won't show in their final product. What killed the Vista Experience for me was the multiple versions and having to pay more to get the full experience. Vista pushed the minimum requirements for PC's considerably more than any other Windows before it. A Windows Vista ready machine, could today run Windows 8 better than it would Vista... but an XP ready machine has no chance of running Windows 8. Vista was a necessary evil if you ask me, overall a pretty disappointing OS but definitely not the worst, that goes to Windows ME.